The modular helmet has been a boon to the lives of riders who want full-face protection but wear glasses or want to be able to take a drink without removing their gear. You'll get that with the Z1R Eclipse Shadow modular, even though it seems like any other basic flip-up helmet at first. With the Eclipse, you have a full-face helmet with open-face accessibility. A fiberglass shell and thermoplastic chin bar will be your sacrificial offerings to the road in the stead of your skull. Z1R's modular has ample ventilation to keep your head cool and cut down on fogging. Like all modulars, the Eclipse is going to be louder than your average full-face helmet due to wind turbulence. This helmet, however, is quieter than you might expect from a modular and the additional noise is no match for ear plugs. I have heard from other riders that the sizing chart for all Z1R helmets is non-standard, so be sure to check the measurements. Even if you want to buy online, it's a good idea to find a shop where you can try on a few models. Z1R's helmets have a price range right up there with the competition, so it puts them in the "shop around" category. 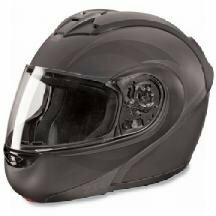 The Eclipse is DOT certified, but the locking mechanism for the flip-up visor is plastic, which can make some riders shy away from this design. Modular helmets are a developing technology. I expect we'll see Snell-certified modulars with metal locking systems soon, because the versatility of flip-up helmets, like Z1R's Eclipse Shadow, has made them popular with many riders.